I came into the store today for the first time because normally I deal with the company online. When I came in I was greeted by a beautiful lady named Debi she was so nice and sweet and very helpful she made everything simple for me even after we resolved my issue I sat around and we were chatting for a while, it isn’t often you run into people as sweet as her, I’ll definitely be coming back to this location and I will be recommending this location to any of my friends who are looking for some extra cash.Thanks again debi you are amazing!! Thank you Debi for an amazing experience during my recent visit. This was new to me and she made it very easy. She was so friendly, informative and knowledgeable. I hope you’re there the next time I come in. First time here! Friendly service and Jen was very nice! Took a bit of time but other than that a good experience!Update: Been here a couple times now, over the course of a few months. Have to say and add that over time, the experience has only gotten better and quicker. All the staff is super friendly and helpful. & Debbie is awesome and always a blast to converse with. Kala was extremely fast, friendly and efficient. There are no other quick loan stores that I can trust or reccomend except this one! 100% customer satisfaction. I am a first time customer and Kala, Debi and Max were all very welcoming. You can tell people enjoy working here because the atmosphere was warm and pleasant! Not only that, but the customer service was amazing- I will definitely be referring people here. Thank you for you service, keep it up! The staff at this location are extremely friendly and patient. When I went in for the first time there were a few customers ahead of me. One of them did not understand the procedure of their transaction which Debi (the lady behind the counter) explained thoroughly and in a patient manner, despite their rude and difficult attitude.During my transaction, Debi was very clear and concise, answering all of my questions making sure I knew exactly what I was signing up for. Thank you so much for providing amazing service! Debi and Jen are fun and helpful. A real dynamic duo who made my experience worthwhile. I never thought getting a payday loan would be this cool. Thanks. I have been coming to this location for a few months now. The customer service i have experienced dealing with Deb/ Jen has been exceptional! I definitely would recommend Pay2Day to anyone in a financial jam. Great customer service provided by Jen and Debi. Both were very welcoming and friendly. My first payday loan application was quick and hassle free. Most definitely a great start to my weekend. Have come here a few times and all I can say is that they are the best around. When in a tight spot, Max can take care of you. Many thanks to the management at this location. I can truly say that I have been visiting this location for the past couple of months and I am TRULY HAPPY and PLEASED with the customer service experience I have had with Debi.She has always been very helpful, caring, understanding, conversational, respectful, courteous, patient, and the list goes on. I truly hope and pray that she continues to be a valuable member of the team here at PAY2DAY. Debi thank you for everything that you do, continue to be you, don't change for anyone and many blessings to you in the upcoming New Year 2019. 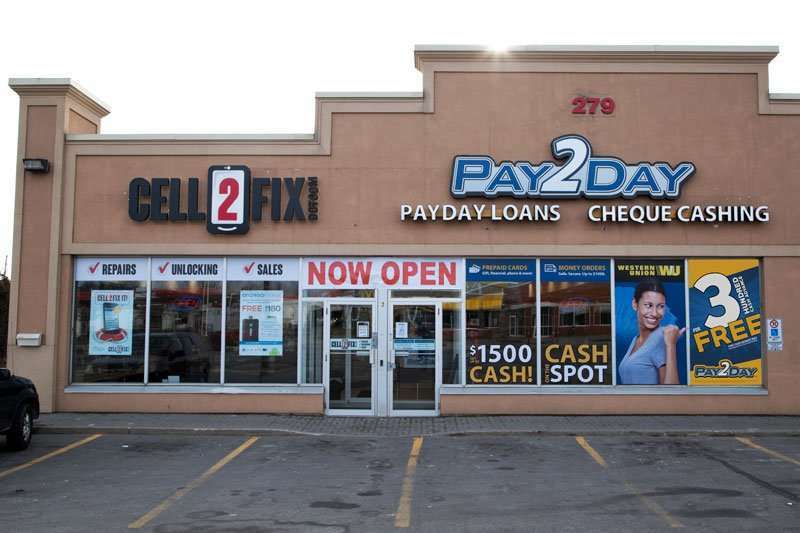 Went to Pay2day Queen and 410 in Brampton,for the 1st time and Jen served me and helped me with what i need,the staffs are very professional and always wearing a smile.Kala and Max also assisted me and were very Nice.5stars for this company. I went into this location with a very disoriented mindset. I was late on my bills and was not having a good day. Usually the service at payday locations are grim, but I was surprised by the service I received from the branch manager Max. I was greeted with a smile and treated as a person not a number. He offered different solutions to help me instead of turning me away. He is truly the definition of amazing customer service and he’s gained a lifetime customer. Thank you max!! This location is always a pleasant experience. Mayor and Jenn are delightful and very helpful. If you ever need a loan Pay2Day is definetly the way to go. No hassle and the staff are awesome. Max at the 279 Queen Street location was fantastic. Highly recommend. I love pay 2day loans because they are in great help for me the services are excellent and the last visit I made was excellent service made by Mr Mayur. Debi was very friendly and informative, she had me in and out in about 15-20 min for a first time customer. The whole experience was painless and my transaction ran smoothly, I highly recommend this company for all you payday loans, transfers and such. My first time going to this place was fantastic. Staff was all super friendly and very helpful. Debi helped me out and she was amazing, very positive and was super nice. Definitely worth going here for business. Krishna. I really appreciate the service. For sure. I will strongly recommend a friend to this location. Keep up.great job. Max was really amazing and provided such quick service. I would really recommend this place to anyone!!! 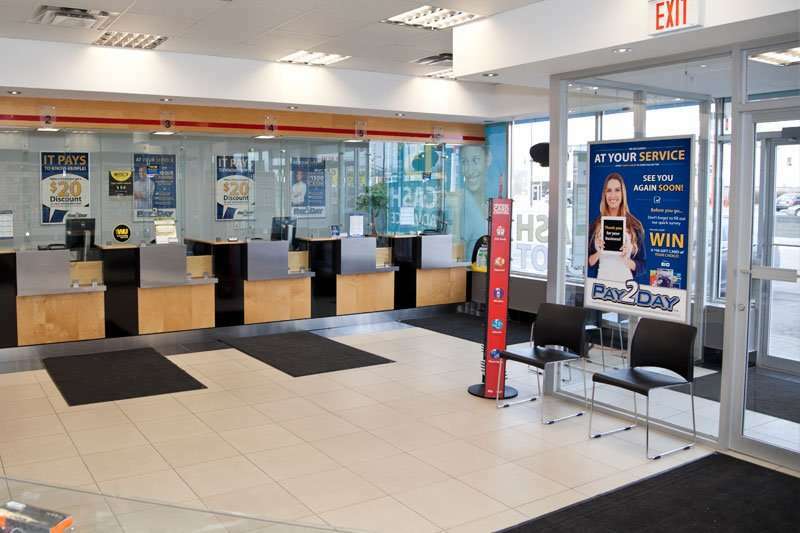 I am very happy with my overall experience at the 279 Queen St E Branch. Max and Ashley were able to assist me with getting a pay day loan. A+ CUSTOMER SERVICE !! Love this location. Ashley is an awesome CSR. Great friendly service, conversationalist. I would recommend this location in a heartbeat! Love this place and Debi is awesome!! She is so friendly and makes me feel welcomed when I visit the store. Thanks pay2day. Debi has great customer service skills. All the staff is friendly. Great efficient service. Sometimes you go through some hard times in life and don't need the judgment from everyone around you. I'm truly grateful I came across this company from the day I started coming here the staff has always been so kind and caring. They always have a smile on their face and we always have pleasant conversation and not awkward silence as we do our transaction. Last night I got to deal with a young girl who I see most Monday nights. She always greets me with a smile and recognizes me. It's the little things that count. Tharsha was such a delight and the customer service I receive from her truly impresses me. I would 100% recommend you do your services here. I don't even have a google account and used my husbands in order to just write this. That's how much I would recommend this place! Don't think twice! Just go! I go here pretty often and have to say the staff is amazing. I was served by a beautiful girl named Tharsha today and she was sweet and kind. Would recommend to everyone. Great company. Would recommend to anyone who is needs a loan. They are very fast and easy. Friendly staff and super helpful. Customer service is excellent! Awesome first time promotion of $300 FOR FREE. Staff are very friendly and amazing to deal with. I would recommend going to this store for quick and easy loans. Amazing customer service, the two female representative were extremely helpful. They took the time out to explain everything clearly & to access my online bank account! They were extremely patience & friendly with their service. It was a quick sign up process & when I went to pay back the loan, it took less than a minute! I RECOMMEND THIS LOCATION! I have been around for a long time and I must say that I have never seen such positive consistence customer service. All the reps that I have dealt with at Pay2day are always friendly, understanding and positive. I have been experiencing some financial hardships and these reps do not let me feel stressed and hopeless, but instead, they make me feel welcome and promising, and that everything is going to work out eventually.Thank you all for your positive attitude and I wish you all the best in your future endeavors. Great rates on loan services. Fast and easy. Best part is the fact that they are paperless. The staff are great and very helpful. They also have western union and cheque cashing. Would definitely recommend this company if you need fast cash. This is honestly the best pay day loan company around. Not only do they have the best rates, but they care about their clients as well. You can always call them is you are having difficulties and they will help you in any way that they can. This company has the friendliest staff and the atmosphere is so welcoming. The lobby is always clean and they often have customer appreciation. The girls that work here are always friendly and smiling and it make me leave feeling like I am just not a number. If you are looking for a payday loan company, look no further. This is hands down the best place around!! !